The Hall of Fame UConn coach would be happy to have the two starters he has playing at a high level. 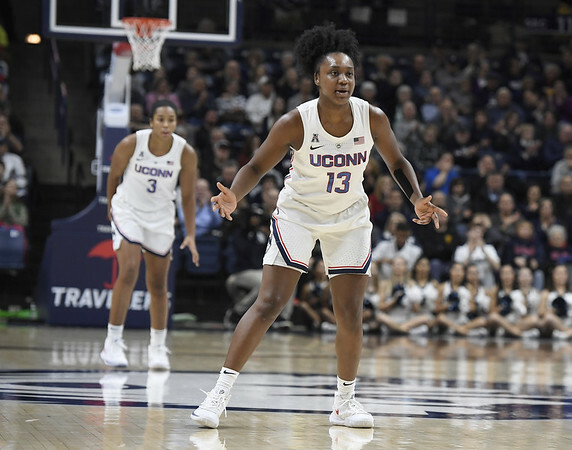 While point guard Crystal Dangerfield had a tough shooting night in the third-ranked Huskies’ 79-39 rout of SMU in American Athletic Conference action Wednesday at Gampel Pavilion, the junior continued her strong floor play with eight assists to just one turnover. In her last five outings spanning 167 minutes, Dangerfield has 35 assists and five turnovers. Meanwhile, Christyn Williams saw some light at the end of the tunnel as the freshman guard tries to break out of her slump. She had 12 points on 5-for-10 shooting and three steals in 32 minutes after scoring just four points in her previous three games. “My shot was still off today, but I feel like I was more active,” Williams said. “That helps me know that I’m taking a step forward by doing other things rather than just scoring. Williams’ lack of activity and effort led to her playing just 13 minutes and earning the wrath of Auriemma in last Saturday’s victory at Temple. While 10 of her points Wednesday came in the second half after the outcome had been decided, it was something for her and the Huskies to build on. Dangerfield was key in getting her team off and running on those miscues. UConn had huge advantages in points off of turnovers (26-3) and fast-break points (21-6). Posted in Newington Town Crier, UConn on Friday, 25 January 2019 21:45. Updated: Friday, 25 January 2019 21:48.